I was prepared to write an eloquent entry all about losing an item I hadn’t known I was so attached to. I don’t misplace things very often, and so I was surprised when I couldn’t find it anywhere. A week later, I searched for wrappers under the passenger car seat and behold, the hand mirror was found. I decided to write about it anyway. I bought a hand mirror from el Museo del Prado gift shop almost exactly five years ago—during a J-term class in Spain, 2003. 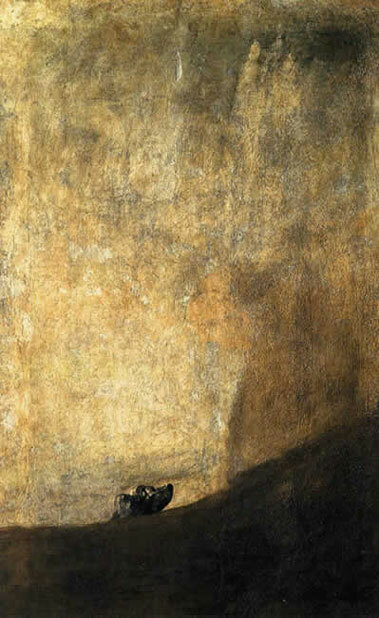 It’s a perfectly round close-up of Francisco de Goya’s The Dog. I had to step close to the actual painting to discern the blob at the bottom of the frame. The rest of the painting is empty and lonely. I thought it was beautiful. It struck me as odd, though, that someone chose to use this rough, stormy image to grace a hand mirror, an object that’s usually bejeweled or colorful. Or maybe it’s fitting—a mirror you can slip into your pocket is usually intended to reflect only your face back, not your and a companion’s. Maybe the isolated dog is there to make you feel better. I’ve only just tried to recollect my contemplation on the image recently, as I had thought I lost the mirror. I wondered why I missed it so much, despite the hinge having been broken and the bottom half of the mirror detached long ago. I realized I must be vain because I was frustrated that I had nothing else to check my teeth with or see how ridiculously shiny my T-zone is. I get paranoid about food stuck between my teeth and that little hand mirror has saved me from embarrassment many a time. January 2003 was my first trip to Europe, and despite the adventures there were pockets of loneliness hiding between them. I distinctly remember sobbing to my mother on my host mother’s phone, curled up on the bedroom floor because my second nephew had been born that day and I was on the thirtieth floor of an apartment hi-rise in a city thousands of miles away, alone. Nighttimes were quiet and although I slept well and even dreamt in Spanish one night, which thrilled me, homesickness grew emboldened but faded by morning. El Museo del Prado was a stunning place, but dark, moody, and the visit marked an end to a lifetime experience that in turn ushered in post-traveling blues. But I’ve still got my Dog with me, five years later. It doesn’t really symbolize my time in Spain—my memories capture more meaning than anything I bought there. But when I actually stop to think of that day, I like to see who I was then, nineteen years old, choosing the mirror off the shelf with the feeling that I had found an unpolished precious gem, being entranced by the song that was playing in the gift shop. Oh–I also have a pen–a cheap pen–plucked from many that were strewn about the counter of a bar during an evening out in Alicante, that has lasted five years. My pal Anna’s identical pen ran out of ink within a few months of our return home. Although I used/use mine constantly, it has yet to dry up.